INOVA Geophysical is a joint venture between BGP Inc. and ION Geophysical Corporation which specialises in technology for land seismic acquisition. Jason Criss and Andy Bull from INOVA consider the challenges ahead for land-based seismic. 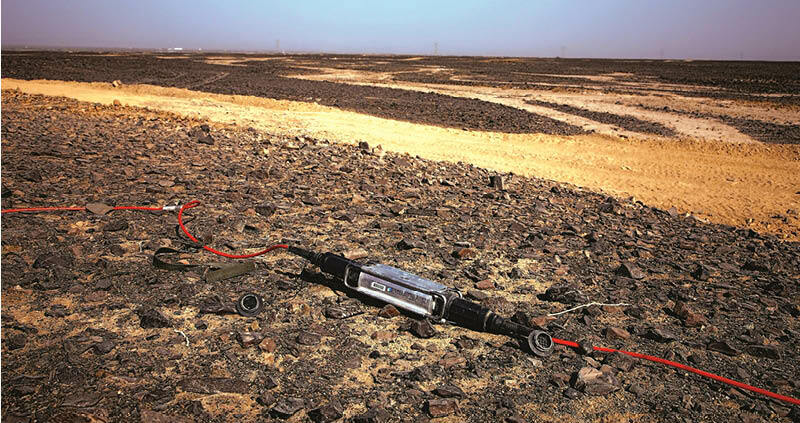 Geophone for capturing and recording land-based seismic waves. Image source: INOVA Geophysical. Looking at future needs for land-based seismic acquisition, what fundamental changes in technology can we expect in the next five years? Oil companies and their exploration teams are continually striving for a better understanding of the subsurface but at a cost and scale aligned to the commercial realities of today’s energy market. Improved receiver sampling along with high productivity and a very wide broadband signal in the source domain are the geophysical drivers for acquisition technology today, which means a constant drive towards smaller, lighter and less power-hungry equipment, while also increasing channel counts without sacrificing system fidelity. Systems with channel counts exceeding 200,000 are commercially available today, allowing acquisition specialists to sample the subsurface in unprecedented ways. In addition, broadband source technology is progressing towards viable high force-energy penetration at frequencies as low as 1Hz. With increasing volumes of data being recorded in the field we expect to see some novel solutions emerging which deal with data management, automation and remote analysis. Beyond the geophysical domain we should also expect to see technologies like the Internet of Things migrating into our industry to help address the challenges associated with deploying a complex operation of personnel, vehicles and equipment in remote locations. What fundamental changes in land-based operations are coming in the next five years? Crews will continue to become nimbler and more productive, with a much-reduced footprint. Areas that have proved difficult for seismic in the past will become accessible. The result will be smaller crews capable of handling nearly any project efficiently, meaning operational efficiencies, improved imaging and a lower ‘social cost’. Nodal seismic systems have already had a profound impact on the efficiency of crew operations in North America and this technology will eventually see global acceptance. The introduction of increasingly viable technologies such as remote monitoring and predictive maintenance will impact the cost-effectiveness of operations and improve visibility. What is the least understood technical aspect of land seismic acquisition? Perhaps surprisingly, one of the least understood technical issues is related to the seismic source and the understanding of the source signature actually transmitted into the earth. While vibroseis technology has advanced dramatically, there are still many aspects of sweep generation and the transmission of that energy into the earth that need to be researched further and resolved. What challenges does the Middle East environment bring to land-based seismic acquisition? Vibroseis trucks in the dessert. Image source: INOVA Geophysical. 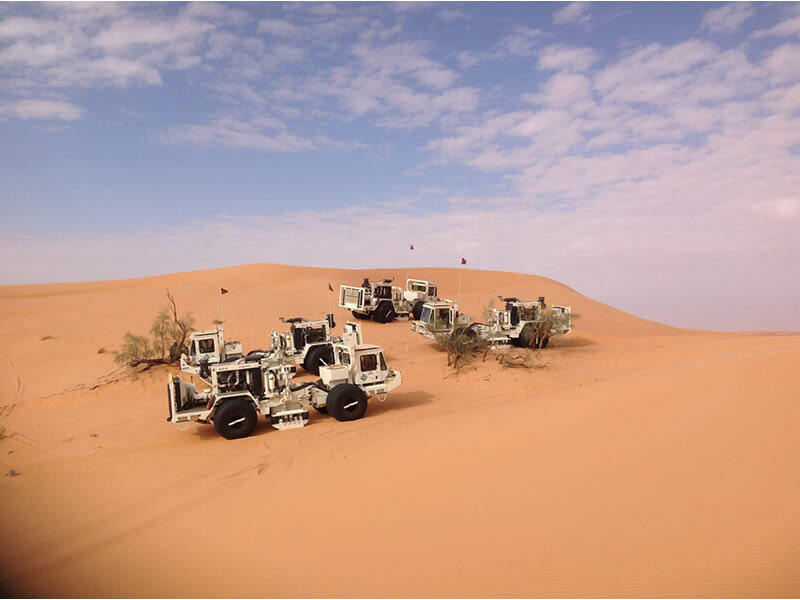 The Middle East has always been a challenge for seismic acquisition because of the remoteness and scale of the projects but it is now firmly established as the hub for most of the technological improvements in our industry. The scale of systems and crews which can be deployed is unmatched anywhere else in the world and the constant push for improved efficiency and quality has resulted in some remarkable breakthroughs in system design and operational methodology. Historically, the area has called for very large crews living in mobile camps in desert areas but an emerging sentiment amongst operators is that crew sizes may have reached their practical limits. The greatest challenge technically and operationally is to continue to increase the productivity of these crews while reducing or maintaining the headcount and improving the quality of the data acquired. These apparently conflicting drivers will undoubtedly lead to more breakthroughs. So, what does the future hold for land seismic exploration? In an era of lower price oil and growth in gas demand, onshore exploration should continue to have a reasonable future. Onshore operations are generally at the lower end of the cost equation when compared with, for example, deepwater operations, so we should expect spending decisions in general to be skewed in favour of onshore work should the current economic climate prevail. However, the relentless push for improved technology and lower costs creates pressures on equipment manufacturers struggling after several lean years. Collaboration amongst competing manufacturers and external technology providers, together with a deep understanding of oil company and seismic contractor requirements, seem like obvious solutions to combat some of these pressures. We have already seen evidence that manufacturers who have embarked on such strategies are slowly beginning to reap the rewards.